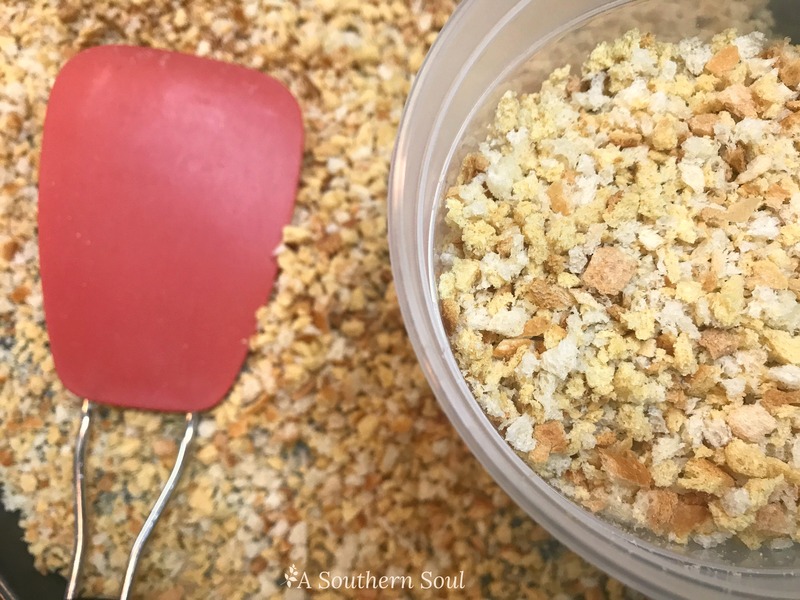 Yummy, toasted, golden brown breadcrumbs are the crowning glory of many of our favorite dishes. The thing is, there have been times in my cooking career that I’ve gone to the pantry to pull out a bag of those crispy crumbs but they were no where to be found. Well…no more! I’ve taken charge of things and now, make my own breadcrumbs. 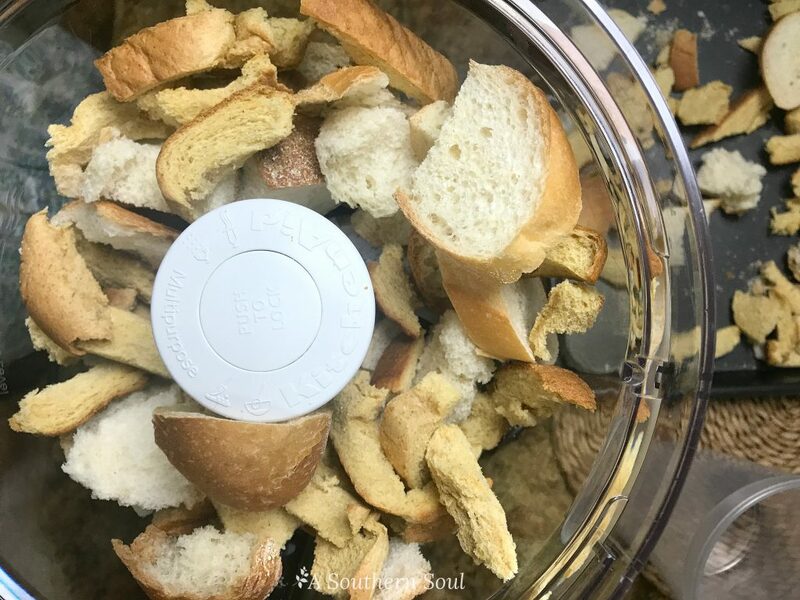 Not only is this somewhat liberating but I also feel good about not wasting those “heels” at the bottom of the bread bag or throwing away that one small, slightly hard end of a baguette. How to make you own breadcrumbs is another one of my simple kitchen tips to help you feel more confident with your cooking skills and hopefully save a little money too. 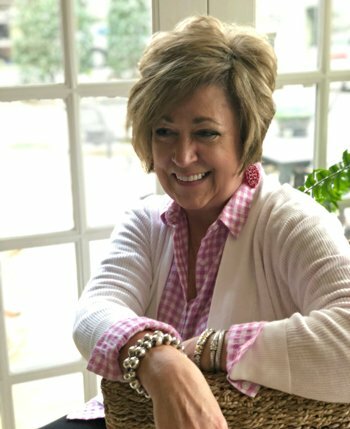 I love figuring out ways to stretch my food dollars and if I can avoid going to the grocery by making something myself, then I’m ALL IN! 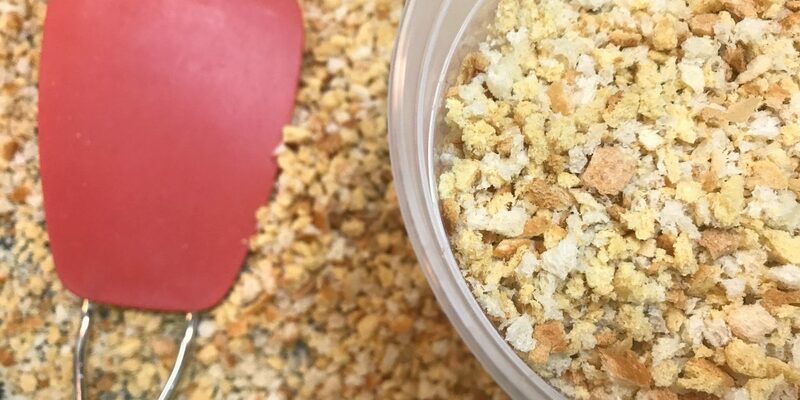 So, here’s how to make your own breadcrumbs. First, start saving up some bread. I save the ends of the sandwich loaves, put them all in one plastic bag and store them in my fridge until I’m ready to make the crumbs. As you can tell from the photo, I also saved the strange edges of bread that has a hole in the middle. The middle of those slices were used to make my breakfast cupcakes and I just didn’t have the heart to throw them away. 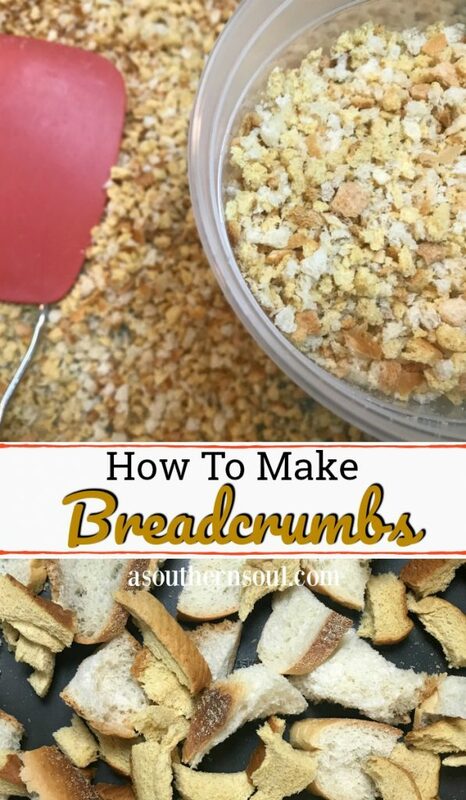 The key to making really good bread crumbs is to make sure the bread is dry and toasted. I think it’s also important to keep the crusts on so that you get different textures once the bread processed. I also use several different types of bread to achieve a great, rich flavor within the whole batch. Once your toasted bread comes out of the oven, let it cool for a bit. Then, working in batches, put the chunks of bread in the bowl of the processor and pulse away. I usually let my blade run for a few seconds at a time then stop and check on everything for just the right consistency. After all of that, well, you are pretty much done. 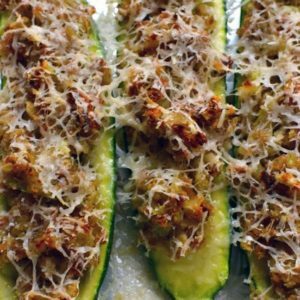 If you’d like extra dry breadcrumbs, you can put them out on a sheet pan and let them air dry for about 45 minutes. If not, then you are ready to package them up to use in all your great recipes. 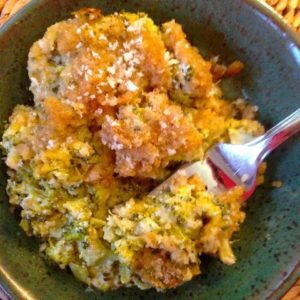 I use them in my squash casserole and as a topping for my family’s favorite pasta bake. It’s also fun to season them with herbs and cheese to add a little extra flavor. 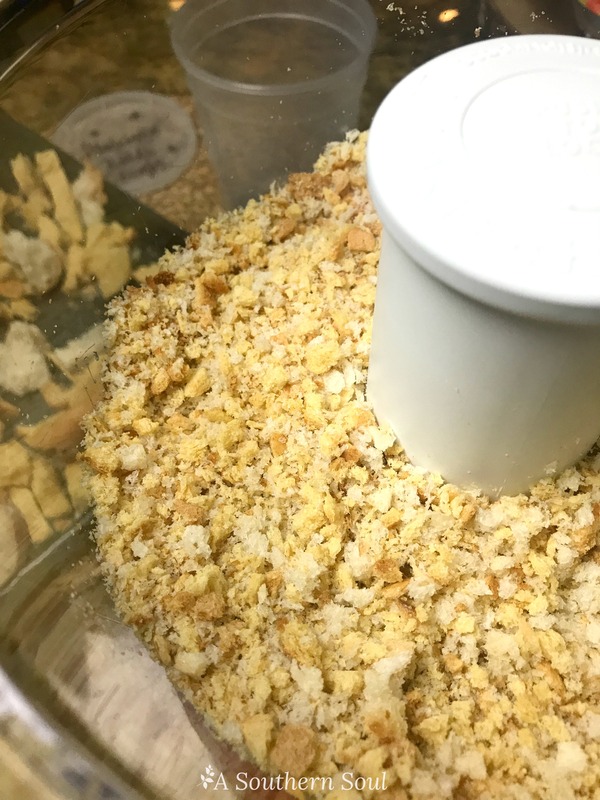 This simple act of making my own breadcrumbs makes me happy because, I’ve saved money, used what I had on hand instead of throwing something away and my pantry is stocked with a useful ingredient that I didn’t have to go to the store for. Sounds like a WIN all the way around. 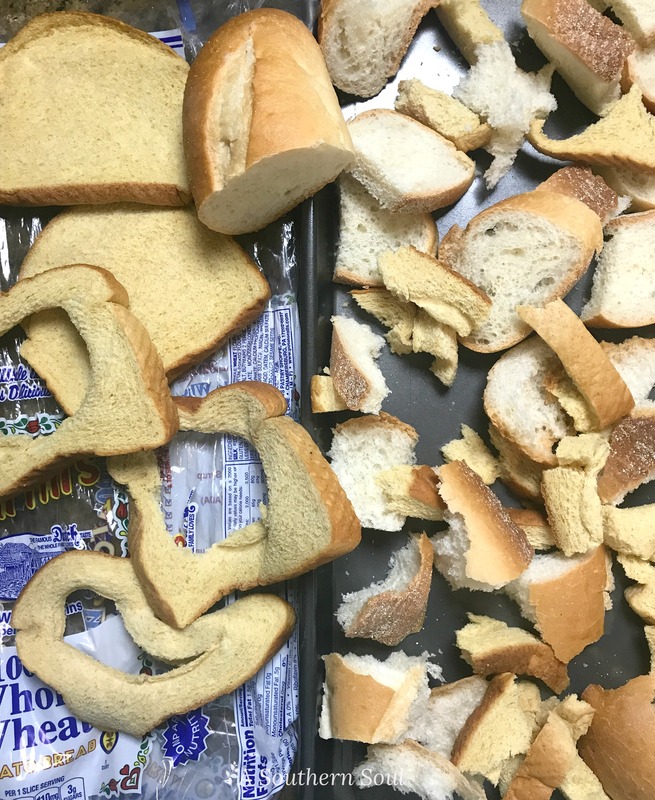 Don't throw away unused bread! 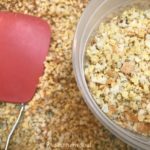 Turn it into breadcrumbs that are super easy to make. 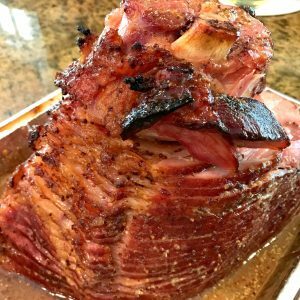 You can flavor them with your favorite herbs and spices plus they will keep up to 6 months. Tear bread into small chunks and place on a baking sheet. Put pan in oven and toast bread for 20-30 minutes until bread is dried out. Remove from oven and let cool. 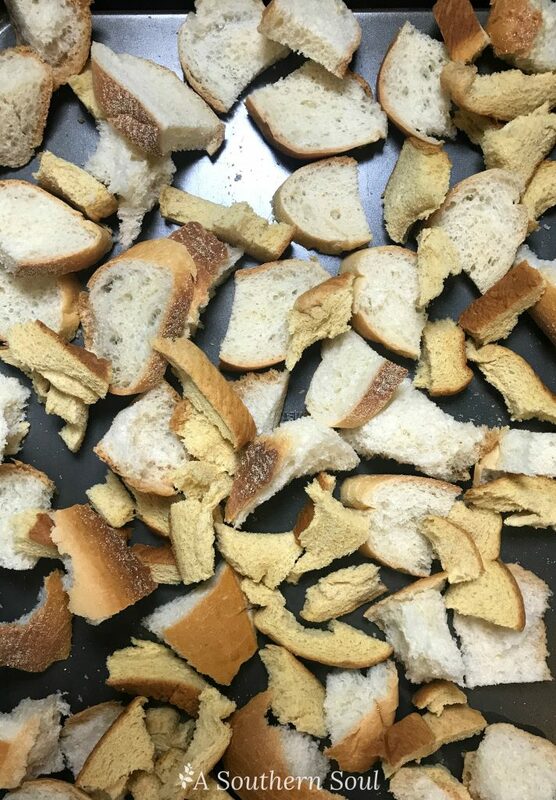 Place toasted bread in food processor. Pulse until bread becomes small crumbs or desired texture. ***This step may be repeated based on how much bread you have. 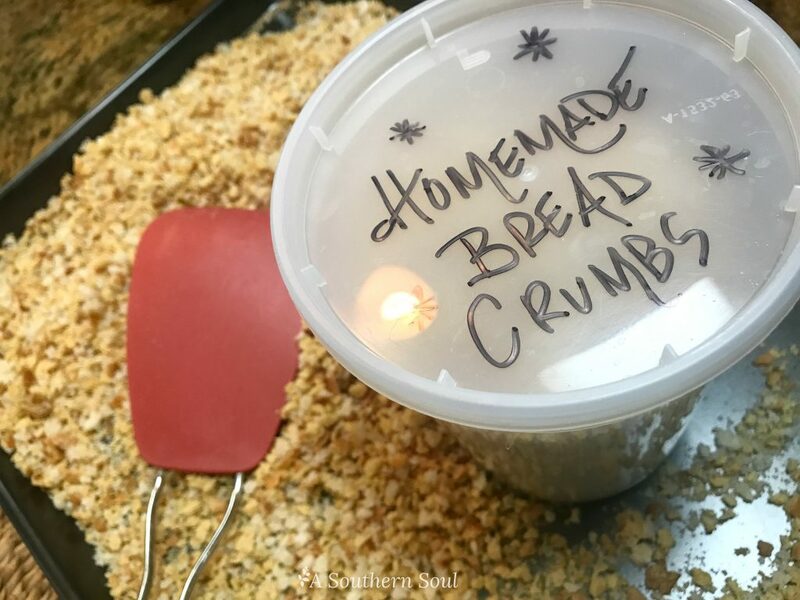 Place bread crumbs into an airtight container. May be stored in a cool dry place for up to 6 months or 1 year in refrigerator or freezer.